Cutbirth & Sanderson General Dentistry provides a range of services for the entire family, from children to seniors. We refer to specialists only when we feel it’s in your best interest to do so. The same procedures are performed at both of our locations, so you can go to whichever office is most convenient for you. We recommend that children begin regular dental checks at age 2. We’re family-oriented, so kids are a big part of our practice. We welcome you to bring your child in with you to your appointments so they can get used to the office. They can be introduced to the idea of a checkup slowly and comfortably. We’ll show them how the chair works, look at their teeth and let them pick out a toy at the end. We find our youngest patients usually enjoy visiting us! Bridges. An option to replace missing teeth by using the surrounding teeth as an anchor. Crowns. For tooth restoration when the tooth structure can’t hold a filling or is cracked. Dentures and partial dentures. Removable, more affordable options for replacing several or all teeth. Extractions. We only remove your regular teeth when necessary. We may be able to extract wisdom teeth but will have to evaluate your situation to determine the best course of action. Implants. Replace a missing tooth or teeth without having to drill on otherwise healthy teeth. Preventative treatment. Sealants, fluoride treatment, X-rays and more are offered to help you ensure your future oral health. Root canal treatment. We may be able to save a tooth by cleaning the root canal, then sealing it off for protection and placing a crown to strengthen the tooth. This is a simple procedure with little or no discomfort. TMJ treatment. Jaw problems are complex and need to be fully evaluated by a professional to identify the source of your pain and identify possible solutions. 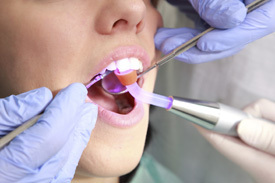 Tooth-colored fillings. We can fill cavities or close spaces between teeth while allowing them to retain a natural look. We understand that some people feel uncomfortable with the idea of going to the dentist. To help you relax, we offer nitrous oxide that wears off in less than five minutes, allowing you to drive home after your visits. Alternatively, intravenous sedation can be explored as an option when necessary. Bleaching. Custom-made trays keep your teeth looking bright. Porcelain Veneers. 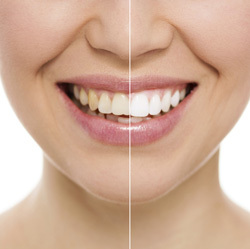 A covering is applied to the front of your teeth to reshape your smile. To put you at ease, we’ll explain each step of a procedure before starting, never rushing you. Even if it’s been decades since your last dental checkup, we’re going to get you fixed up and smiling brightly. You’ll know what to expect during your visit so that you can feel relaxed and confident that you’re receiving the best dental care available. We’re here for you 24 hours in case of emergency. Rest assured you’ll get the best care available from our dedicated team. Contact us today!